Global Travel Media » Blog Archive » Blue Lagoon Cruises Extends Free Upgrade Offer – Book Before 31 May 2017! Blue Lagoon Cruises Extends Free Upgrade Offer – Book Before 31 May 2017! 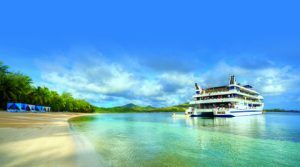 Blue Lagoon Cruises have extended their free upgrade offer on three, four and seven night cruises to the picturesque Mamanuca and Yasawa Islands. Book by 31 May 2017 in a Hibiscus deck cabin and receive a free upgrade to an Orchid deck cabin and cruise into a winter getaway, valid for travel through to 31 March 2018*. Bonus extras in the Orchid deck cabin include complimentary daily stocked mini bar (beer, wine, soft drink, bottled water); tropical fruit platter on arrival; Nespresso coffee & tea selection in cabin; and Pure Fiji sun care gift – PLUS savings up to FJD$2940 per cabin! Visit www.bluelagooncruises.com for bookings and cruise the South Pacific this winter. Prices start from FJD$2200 share twin in a Hibiscus Cabin on a three night Explorer Cruise. Known for combining soft adventure with leisurely rest and relaxation in 4-star boutique surroundings, Blue Lagoon Cruises offer a multitude of activities for guests throughout the spectacular Mamanuca and Yasawa Island playgrounds. Aquatic based activities include swimming with Manta Rays (May-Oct); guided snorkeling safaris; glass bottom boat excursions; and a visit to the sacred Sawa-i-Lau Caves. Exclusive to the seven night cruise, guests will swim with reef sharks and visit the film location of the Tom Hanks movie ‘Castaway’. On land, Blue Lagoon’s private beach island, Nanuya, provides a secluded location for rest and relaxation and a memorble dining experience under the stars; while beach picnics and guided walks, island village and church visits and Fijian cooking lessons will keep guests active. On board, Meke performances and nightly entertainment such as movies under the stars are on offer. A maximum 4 hours cruising per day ensures guests spend more time exploring onshore and less time on the ship. Cruises are always personal and friendly with the all-Fijian crew on board small ship Fiji Princess accommodating just 68 passengers.